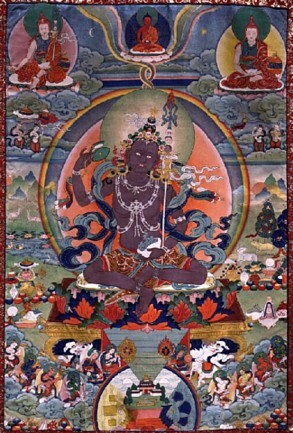 "It is not only at this moment, now, that the root lama is with us. In all his kindness, he has never been apart from us in any single one of our lives throughout beginningless time, because he is the manifestation of our mind’s true nature, appearing externally in all kinds of guises, pure and impure, in order to help us, either directly or indirectly. Right now, on account of all the merit we have accumulated in the past, he has taken on the form of our spiritual friend, and because of the strength of this karmic connection, we have been able to meet him, he has given us the nectar of the profound and vast instructions, and he has enveloped us in his tremendous kindness. From now on too until enlightenment, he will never be separate from us for even a single instant. However, just as the moon is not reflected in cloudy or turbulent water, when there are faults in our samaya, it can appear to us as if there is some separation between us and the master. Yet this is merely due to our own minds, and there is never any question of distance on the part of the master." Sogyal Rinpoche, The Tibetan Book of Living and Dying, page 138. This page was last edited on 22 December 2010, at 09:45.